I finished my last “read local month” book today, appropriately enough. I closed out the month with three more entries: Sacrificial Lamb Cake by Katrina Monroe, Dear Committee Members by Julie Schumacher and Rogue Angel: The Matador’s Crown by Alex Archer. 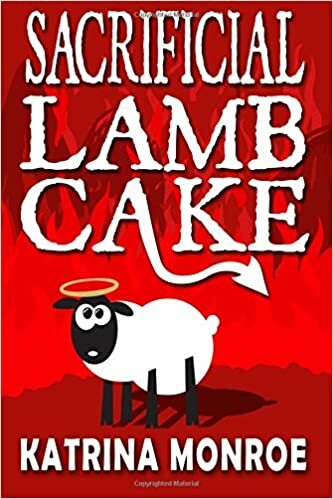 Katrina Monroe’s Sacrificial Lamb Cake is a rollicking farce in the mode of Christopher Moore. If you take your religion seriously, this may not be the book for you, but if you are open to the idea of the second coming arriving in the form of lesbian waitress/artist from a family of ecoterrorists, then you’ll love this book. The author envisioned God as corporate CEO of “Trinity Corporation” and I thought the whole conceit of heaven as a business played out as a witty statement on big money mega churches. Like Moore, Monroe’s book is well researched and knowledgeable about the biblical stories it drew from. Irreverent? Yes. Hilarious? Yes. Read this, and I predict we can have a book club meeting with the author on a cozy bench in Hell someday. I wasn’t familiar with the Rogue Angel series by Alex Archer, but I had acquired a book from the locally based author of this particular entry. Alex Archer is a pseudonym and many authors write for this series centered on an archeologist, Annja Creed, who also wields Joan of Arc’s battle sword. I read “The Matador’s Crown” which is somewhere in the 30s. These books are intended as stand alone titles and I had no trouble catching on to the concept quickly. It was okay. The mechanics were fine, but content-wise, it was below my background knowledge level. I’d have no trouble sharing this with my tween, but I prefer my archeology books to delve a little deeper into the history. 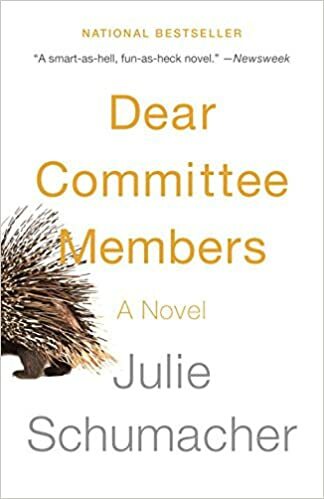 The absolute standout for me, in what has been a pretty terrific month of reading, is Dear Committee Members: A Novel by Julie Schumacher. Covering the span of one Minnesotan college’s academic year, this is a book that tweaks the epistolary form so that it is written entirely in Letters of Recommendation from a worn out academic. Who know you could put together so much plot in a series of letters that at first seem unrelated? This book reminded me of what I loved about being in grad school, but also why I am okay with my decision not to pursue academia as a career. It was painful and brilliant and funny, often at the same time. Few books make me snort coffee out the nose. This one did and that (in my mind) is high praise. Overall, “Read Local” month was a success. I read four new-to-me authors and visited a dear literary friend. I learned some history about my adoptive state of Minnesota, and also found a lot of humor. For a low-glamor state, Minnesota has a lot of talented writers. Maybe the long winters help foster creativity. All I know for sure, is I will seek out more books from local authors after this. I’m approximately half way through both the month and my reading list for read local month. I moved to Minnesota about two and a half years ago, and during that time, I’ve been impressed with what a book lovers paradise it is. I won’t put together a list of Minnesota authors here, but there are a lot who can make some claim to the state. 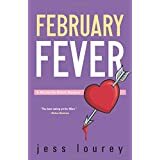 I kicked things off with Jess Lourey’s February Fever. Although most of the book takes place on a train and not in the fictional Minnesota town of Battle Creek, I enjoyed what appears to be the final caper in this cozy mystery series. Lourey’s books probably did more to alter my perception of Minnesota in the years before I moved here. In my mind it was all snow, Prince, Hamm’s beer and a place you wrote on an envelope when you had a cereal rebate to collect. Lourey’s Murder by the Month series changed that, with the loving descriptions of gardens, Nut Goodies and the MN State Fair. Lourey’s Minnesota looms large in my mind. Subtract out the murders, and you get a sense of what makes Minnesota special. I started a steampunk novella set at sea, but I couldn’t get into it so I set it aside. The writing was fine, but the story world didn’t grab me and there are too many other books to read. 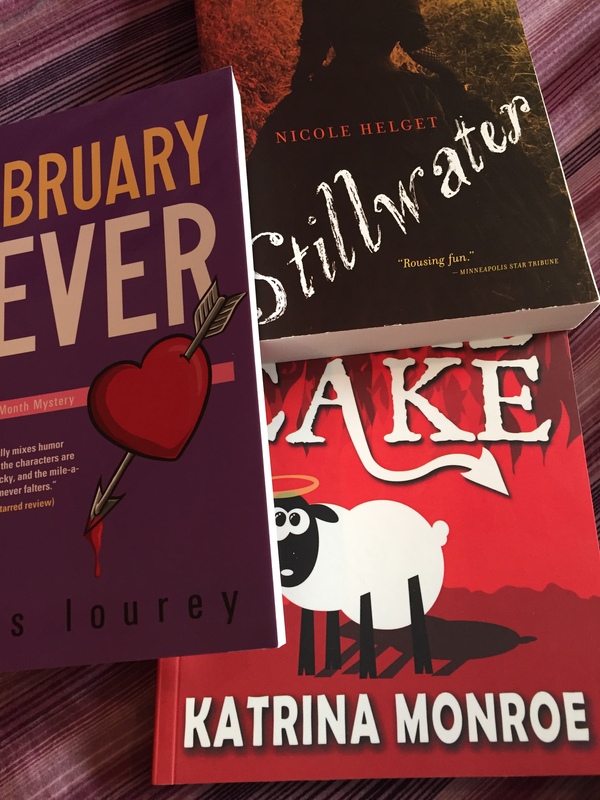 I rounded out the first half of the month with Nicole Helget’s Stillwater, a book I bought in Stillwater, MN at the delightful Valley Bookseller. Helgert is a new to me author, but I’m glad to know she has two more books waiting for me. Stillwater is set in the mid-nineteenth century, at a time before Minnesota was a state. Local Minnesota history is fairly new to me, so I’ve been borrowing my 6th grader’s textbook to learn more about it. I loved how Stillwater brought together so many of the people integral to formation of the state. Helget showed how the different populations, competing indigenous tribes, European settlers, women of ill-repute, small traders, runaway slaves, church officials and logging barons each brought different elements to the path to statehood. There is so much history packed into this relatively slim volume, but it never feels heavy-handed. At times, I would have liked to explore those paths more, but perhaps it will inspire me to pick up more non-fiction. The author’s use of language created beauty out of log jams, death, and pre-paved roads. I don’t read a lot of historical fiction typically, but this makes me want to read more. So, two winners. There are a lot of good books out there. Since my local farmers’ markets won’t open for awhile I’m declaring March “Read Local” month. For me, this means a month long focus on Minnesota authors. I have a few others tucked away too. I loved Jess Lourey’s Murder by Month series even before I moved to Minnesota, so I’m looking forward to that one first. The heroine, Mira, is my Minnesota gardening guru. I’ll post my progress (and reviews) from time to time. Comment below if you wish to share in the “Read Local” fun. All I ask is you make a commitment to read local for a month and share any great books you encounter. This post is as good a place as any keep comments, so I’ll pin it for March. Thanks for playing. I’m a little over two weeks late with my final book for the January Project, but The Fairy Swarm may be my favorite of the bunch. It took a little longer to finish this book because my 8 year old and I have been reading this together at his bedtime. My 12 year old finished it in an afternoon and I suspect my son finished it long before he and I snuggled up for the last chapter. The Fairy Swarm is the sixth and (it appears) final book in the excellent “Imaginary Veterinary” series. I really hope it isn’t the last of these characters because I have adored every book in this series, and more importantly, my kids love them too. The Fairy Swarm delivered on everything I love about this series. The heroes, Pearl and Ben, are both ten years old and they act like real kids. Sometimes, they are smart, sometimes they make bad decisions. Sometimes they are brave, sometimes scared. Sometimes they get their feelings hurt and sometimes, they hurt someone else’s feelings. The emotional landscape of these stories has prompted a lot of conversations in my house. We use moments where the characters feel lonely, clever, angry, patient, scared, bored, curious and so on to discuss times they feel the same way. As a parent, this is huge. The books also offer terrific insight into friendship. Pearl and Ben come from different backgrounds (Los Angeles resident Ben is visiting his grandfather for the summer; Pearl has never left the town of Buttonville). Neither has lots of friends, but both have good hearts. Pearl often tumbles into action before thinking, whereas Ben tends to think before speaking, but both learn to appreciate the other’s approach. Furthermore, Suzanne Selfors is a terrific author. The pacing keeps busy kids wanting to turn the page and the writing is at once clear and vocabulary stretching. Kids will be motivated to read these stories for the humor and the mythical creatures occupying every page. Who doesn’t love a good Sasquatch? The titles reveal a primary legendary creature for each book, but many more occupy the pages. Fairies, Dragons, Satyrs, Unicorns, lake monsters and more need veterinary care. The blend of fantasy and real world is charming. Although, thanks to these books, if I ever do run into Big Foot, I know exactly what I’ll need to capture him and turn him into a yoga partner. 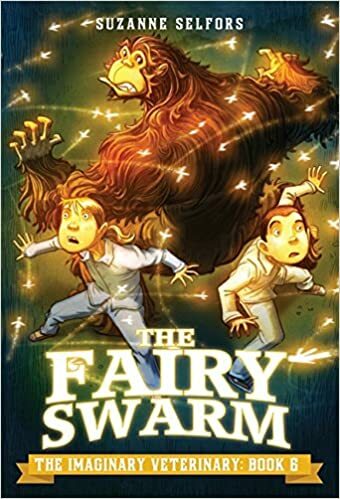 I haven’t posted many buy links, but here are links for The Fairy Swarm if you need to buy online, otherwise, beg your local library or independent bookseller to stock it for you. 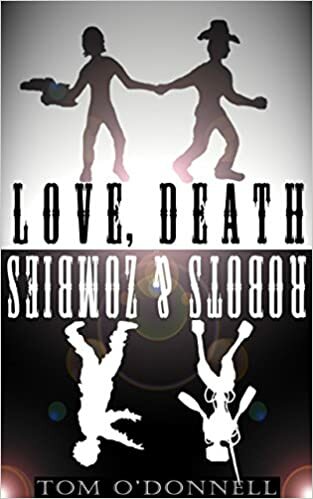 In my search for books with less than 20 reviews to read for The January Project, I came across a Kindle freebie for Love, Death, Robots, and Zombies by Tom O’Donnell. The title tells you exactly what to expect, as all four elements are there in the book, and the price was certainly right. But, to be honest, while I love plenty of books with love, death, zombies and/or robots, this wasn’t to my taste. On the upside, the author created a unique post-apocalyptic world and I particularly enjoyed the complex and multi-layered relationship between humans and robots. The writing is solid, although there were a few missing words here and there that I suspect were part of an uploading issue. First person present tense is not my favorite point of view, but the author used it effectively, particularly in the battle scenes. The story follows the journey of a fifteen-year old boy, Tristan, who must leave his library home after raiders find it. He sets off to find a new home with his robot dog and Echo, a teen girl who was his childhood friend before she took up with the raiders. En route, they meet other humans, robots and zombies with differing goals and have to decide who is trustworthy and who is not. It’s a good premise, but wasn’t enough to keep me from thinking about other issues with the story. I have to wonder who was the intended audience? I’m not a big sci-fi reader, so I don’t have a sense if there is an age breakdown or not for materiel intended for teen readers and those for adults. There was almost no swearing, until the last thirty pages, and the shift seemed jarring. Until that point, I would have guessed the audience was tween boys. What really irritated me as a reader was gender politics. As an adult woman, reading this book made me feel icky. The female characters, of which there were two, may as well have been blow-up dolls. One is beautiful, but has no personality. The other serves the primary purpose of being penetrated. The hero seems to be under the impression this girl wants to be sexually used. We know he’s a hero, because her free wheeling sexuality makes him sad. The hero does not see her as a victim of sexual abuse, so it is never called out an inappropriate behavior. ICK! Double ICK! ICKY, ICK, ICK, ICK! I cannot endorse this book, but the author will probably sell lots of books because of this one review. This book got me thinking about something I learned in film classes called “The Masculine Gaze.” I suspect there is a literary bias toward “The Feminine Gaze,” particularly in literature aimed at the under 18 set. Maybe some of my dislike for this book stems from my expectations for competent female characters. This bias is a topic I hope to address more fully in a future blog. In the meantime, I want the books I read to have strong characters, male and female and I want the books my kids read to have strong male and female characters too. Fortunately, there are a lot of great choices out there. I finished War and Grace: One Woman’s Time at the Trenches by Desmond McDougall a couple of days ago, but sitting down to write a review has proved a challenge. My thoughts are still disorganized, so I’ll attempt to sort them out here. 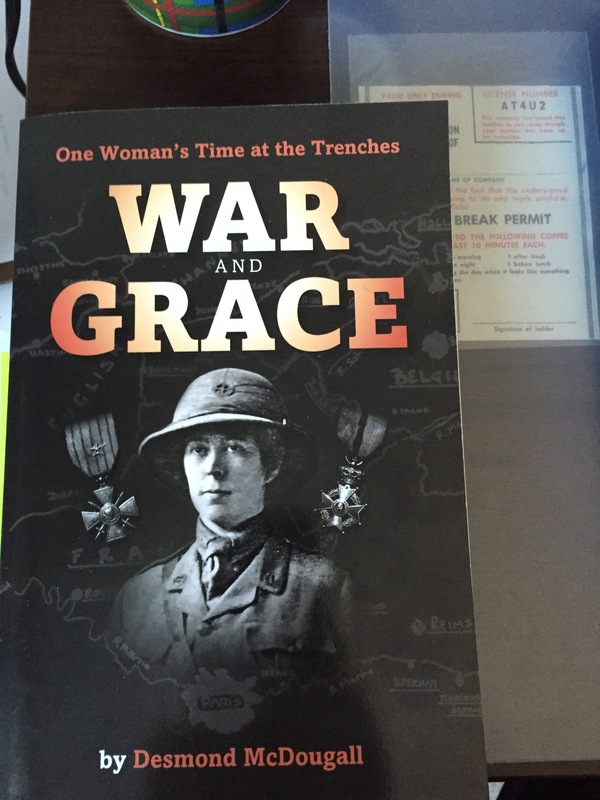 War and Grace is the story of Grace McDougall nee Smith, a leading figure in the FANY (First Aid Nursing Yeomanry) and a woman who passed most of World War I serving near the allied battlefront. Her youngest son wrote the book and many times while reading, I was swept with nostalgia for my childhood moments of listening my grandpa tell stories about the Civil War that he heard from his who fought in it. Reading War and Grace was like overhearing another family’s history. As I process the book, I struggle to merge the family story feel with my trained historian brain. Some elements drove me bonkers, and yet, I can’t remember the last time a book spiked my curiosity the way this one has and left me totally jazzed about jumping down the rabbit hole of research. The nitpicking critical part of my brain wanted to remove the unnecessary exclamation points and have more context. I suspect the author wrote as he talked. The prose is a bit clunky in places and prone to hyperbole, but I think that is part of why this story tapped into my nostalgia for my grandpa’s stories. As for the context, some of the individuals and places referenced may be more familiar to those who went through the British school system. I consider myself fairly well versed in European history, but I had a hard time grafting the events in War and Grace onto the overall timeline of World War I and my understanding of British involvement in the war and the military hierarchy. I’m a map girl, so I’m glad one was included so I could see the areas where FANY operated, but having a few dated maps that showed a snapshot of the battle lines would have heightened my temporal grounding. I would have loved a reference list as well since the author mentioned several published and unpublished works used to guide his storytelling, but I was left to wonder how much came through the filter of memory. And yet, in spite of, or perhaps, because of, these shortcomings, I cannot wait to read more about this subject. I was unfamiliar with FANY and the role of women at the front lines outside of the work of the Red Cross. Grace McDougall is a fascinating woman who should be more widely known as a feminist pioneer. Grace’s life intersected with then socio-cultural shift from the 19th to the 20th century. A strong moralist streak and deep seeded patriotism drove her to challenge the patriarchal establishment. The nature of this being Grace’s story means the reader does not get a complete picture of the obstacles she faced and how systemic they were. I want to know what other women thought of Grace and her struggle for equality. Were other people as in awe of her as I am or did they find her a nuisance? This is fascinating stuff. I need to read more about it. If the sole measure of a book is how excited the reader feels, and how much they talk it up with anyone who will listen, then War and Grace is a 5 star. I’m going with a 4 because of the style elements. If you are interested in World War I, or British history, or history in general, this is a worthwhile read and the paperback is fairly cheap on Amazon. My daughter wants to read it. If she does, I’ll share her thoughts. And if anyone out there can recommend further books on the subject of FANY or women in World War I, please let me know. You’ll help me save a little bit of time researching what to read, and let me have more time reading. Thanks. There were surprisingly few unread books on my Kindle with less than 20 reviews, but Threads of Desire (Creative Hearts Book 3) by K.M. Jackson was one of them. I have not read the previous two books in the Creative Hearts series, but that didn’t matter. Threads of Desire works as a stand alone, but I suspect there are some Easter Eggs for those who have read the first two in the series. I Threads of Desire is a contemporary romance with a friends to lovers trope and is the sort of story that can only take place in New York City, and I mean that in the best possible way. The heroine, Gabby, works in the fashion industry, and the hero, Nick, is in finance. The author, K.M. Jackson presents a lived in New York City that is realistic and reminds me of what I miss from the brief time I lived in the NYC area. The city was my second favorite character in the book, behind Gabby. So often in the romance genre, the characters are all fabulously wealthy and successful, or at least the hero is. Part of my enjoyment in this book came from the characters’ professional struggles, which made them far more relatable than a billionaire-vampire-shiek. I particularly found myself drawn to Gabby, a curvy designer in the size zero fashion world. The author doesn’t reveal Gabby’s size and she doesn’t need to. I love that Gabby is happy and confident with who she is physically. She doesn’t need to lose weight to fit into some off the rack dress. Gabby makes her own style. The author’s description of design and fabrics seemed to come from a place of knowledge that ran deeper than watching a few episodes of “Project Runway.” Threads of Desire tapped into the same awe I get when watching “Project Runway.” I may not be fashionable myself, but I love witnessing creativity at work. This book gave me a glimpse behind the curtain. I didn’t love the hero in quite the same way as I did other aspects of the book. But all in all, this was an enjoyable by an author I’ll seek out again. I discovered I have another book by K.M. Jackson on my kindle, Bounce. The short tease for Bounce offered at the end of Threads of Desire has earned that book a promotion to the top of my to-be-read list once I’m through with the January Project. Bounce has a lot of great reviews already.